If you're in the market for a 4K HDR video streamer that can also stream games from both the cloud and your PC, the Nvidia Shield is by far your best option. In fact, it's your only option. If you don't want that level of high-spec lushness, you might as well go way cheaper and get an Apple TV, Amazon Fire/stick or Google Chromecast. Gamers would be better served, in nearly all cases, going for an Xbox or PS4. So what we're left with is a fantastic bit of hardware that is paradoxically hard to recommend for large chunks of the globe's population. However, with Google Assistant coming 'soon', that could change. And in pure performance terms, it really is a great bit of kit, and just perfect to pair with one of the best 4K TVs to buy. 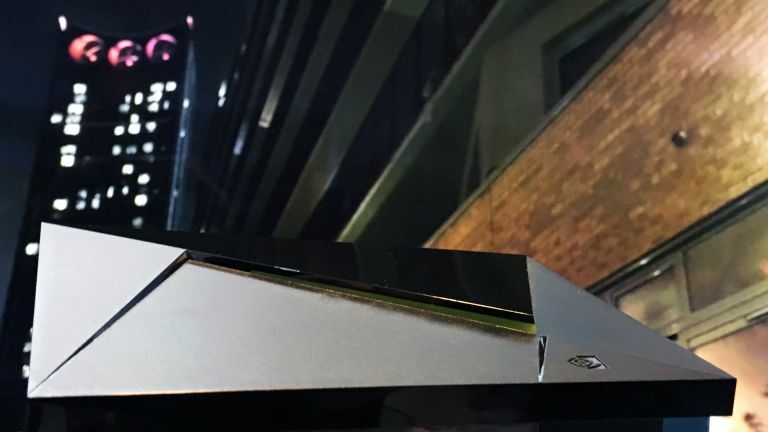 Those of you familiar with the previous Nvidia Shield TV will be aware that it was extremely powerful, rather large, and came with a really ugly joypad and nothing else. So straight away there's a big step forward for version 2, which is extremely powerful, nicely compact, comes with an utterly hideous joypad, and also a handy media remote with a voice control mic built in. Spec is remarkably similar to version 1, with a 256-core Tegra X1 processor, 3GB of RAM, 16GB of storage (no SD slot for expansion this time, though), AC 2x2 Wi-Fi, Bluetooth 4.1, Gigabit ethernet and 2x USB 3.0. The software is new on the 2017 Shield TV, but that's also been provided as an upgrade for older Shields. So essentially this is identical in all significant respects to the older model, but comes with a new and improved (but still ugly) joypad, an additional controller and is a lot smaller. At the top end, there's support for 4K HDR at 60fps, Dolby Atmos and DTS-X. Obviously, there's not a lot of compatible stuff for that, but it's solid future-proofing. The full spec's here. Netflix (including Netflix 4K), Amazon TV, YouTube and local video streams via Plex are all supported via Nvidia-specific versions of the apps and they look fantastic. Dip into the Android TV Play store and the likes of iPlayer, Play Movies and more obscure streaming services such as Mubi still look very good indeed. Spotify is now, finally, supported by Android TV, and the Shield also serves as a Chromecast receiver. My only bugbear was that there was some kind of issue with aspect ratios which meant the image was stretched when my Panasonic TV was in automatic aspect mode. Switching to 16:9 corrected this, Nvidia professed bafflement and had no suggestions as to what might have caused it. Not a deal breaker. This is where Shield TV really earns its entry price. Local streaming from your PC at "up to 4K" resolution is incredibly impressive and streaming from the GEForce Now cloud service, like a sort of Netflix for gaming, is little short of miraculous. Quite why you would choose to use either approach, rather than just plugging your PC into your TV, or buying a console, I am not quite so sure about, but there's no doubt that Nvidia has taken two technically very tricky tasks and pulled them off with aplomb. Local game streaming runs just dandy on my, generally quite crappy, local network. I was getting 1080p and 60fps without it breaking sweat, with no discernible lag. This is because it's your PC doing all the heavy lifting, rather than the Shield TV's Tegra X1. That's impressive enough, but GeForce Now lets you have the equivalent, Nvidia says, of one of its GTX 1080 cards, direct from the cloud. I remember OnLive, which took a similar approach – you play a game at home from a PC in a server farm somewhere – but was, shall we say, not quite the finished product. This is the finished product. The lack of latency and the quality of the graphics over a roughly 20Mb broadband connection is little short of stunning. What isn't so stunning is the choice of games. You've got Witcher 3, some Batman: Arkham and Tomb Raider games and… a lot of pretty middling, old titles. The service costs £7.49 per month, and the better games cost about what you'd expect to pay for them on a console. So while the way the service works is jaw-dropping, it's hard to get too excited about what's on offer to actually play on it. A tie-up with Ubisoft that would see its games added on the day of release has been mooted, but there's no confirmation of when (or if) that will happen. Shield TV also gives you access to all the Play TV and Nvidia Android games, and there are some solid options here: Portal, Borderlands: the Pre-sequel and Metal Gear Rising, for instance. But again, at £5-£15 a chuck, there's perhaps not enough to make gamers quite jump for joy, here. These Android titles, incidentally, are downloaded to the 16GB of internal storage, rather than being streamed. The Shield TV joypad, though ugly, is very usable, to be fair. Maybe not quite up there with the Xbox or PS4 controllers but comfortable, very responsive, and a good size. Furthermore, once it's in your hands you no longer really have to look at its unpleasant, isometric, 'costume jewellry' exterior. That's a big plus. This isn't actually included yet, but will roll out when Google launches Home in Europe. In effect, Nvidia Shield TV will become a Google Home. Nvidia even has a Home-style listening speaker lined up. And if you don't want one of those, you can use the mic built into the bundled media remote. This should immediately make the quite high asking price of the Shield TV seem more bearable, adding as it will Amazon Alexa-style access to news, music, apps, and control of smart home accoutrements. This also underlines another key strength of Nvidia Shield TV, which is that Nvidia does take updating it seriously. That's why owners of the old Shield TV are able to enjoy all the new features introduced for this model. That will even include Google Assistant, although they will have to buy one of the new remotes, with a microphone in. Owners of this version get it included. I've got some reservations about who will actually want to buy the Shield TV, but that doesn't change the fact that it's a hugely accomplished product, that's only going to get better as more 4K/HDR content appears, Google Assistant comes online and, hopefully, the GeForce Now library expands. As a means of watching movies and catch-up TV, it's as good as anything out there, while the game streaming is fan-tast-ic. Would I buy one? No, I'd just stick with my PS4. But I still think this is a very powerful little box of tricks that, for a certain type of high-end user, will be the answer to all their prayers.